Hydrogel masks! They’re a little on the pricey side, so when I see them on sale, I jump all over them. That’s how I ended up with my Innisfree hydrogel mask haul, which introduced me to this, the first hydrogel mask that I haven’t loved. At least the packaging is pretty? 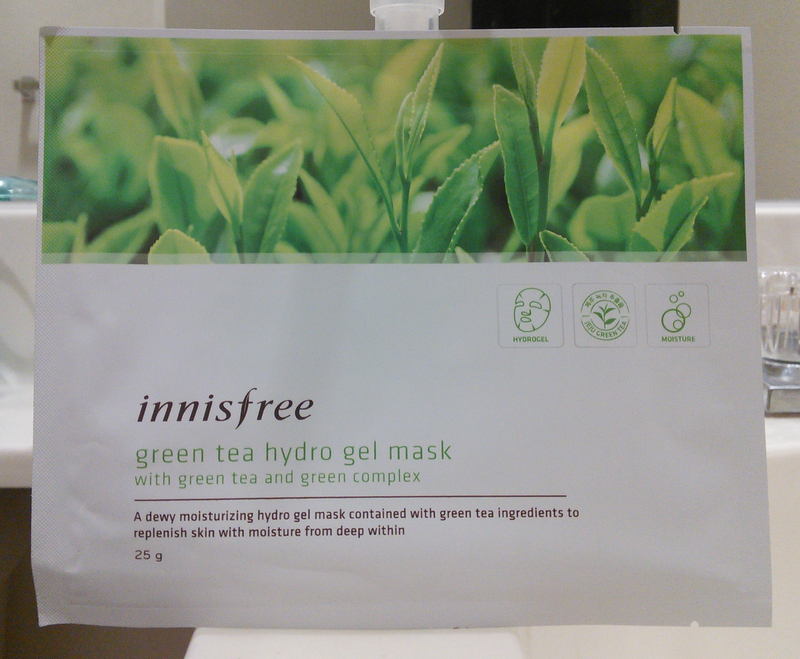 Purpose: The Innisfree Green Tea Hydro Gel Mask claims to moisturize and deeply hydrate skin. Do not use if: You are sensitive to the seaweed extract carrageenan, fragrance, or anything else in the ingredients list. When and how to use: After cleansing and after or in place of any toner, essence, or serum steps in your routine, remove mask from package, peel off the protective plastic layers, and apply to face, putting the lower half on first. Wear for 20 minutes as directed on the package or longer if desired. Remove, pat in any remaining moisture, and seal with your usual moisturizing cream or sleeping pack. Seriously, ignore the instructions to put the top half on first. Putting the bottom half on before the top will keep the bottom part from sliding down. Notable ingredients: The star ingredient of this mask is camellia sinensis (green tea) leaf extract. When ingested, green tea is known for its antioxidant and anti-carcinogenic properties. Applied as a topical treatment, green tea extract has been shown to be anti-inflammatory and antioxidant as well, helping to prevent UV-induced oxidative stress and damage to skin and therefore serving as a preventative measure against photoaging. It’s a little disappointing to see the ingredient so far down in the ingredients list here, but this mask does also contain a nice mix of other antioxidant, brightening, moisturizing, and calming plant extracts, so I’m willing to give it a shot to reap the results of the whole package. The mask also contains lactobacillus ferment, which I like seeing in skin care products’ ingredients lists (my DD’ell Extra Vitalizing Serum review contains more information about the skin care benefits of fermentation). 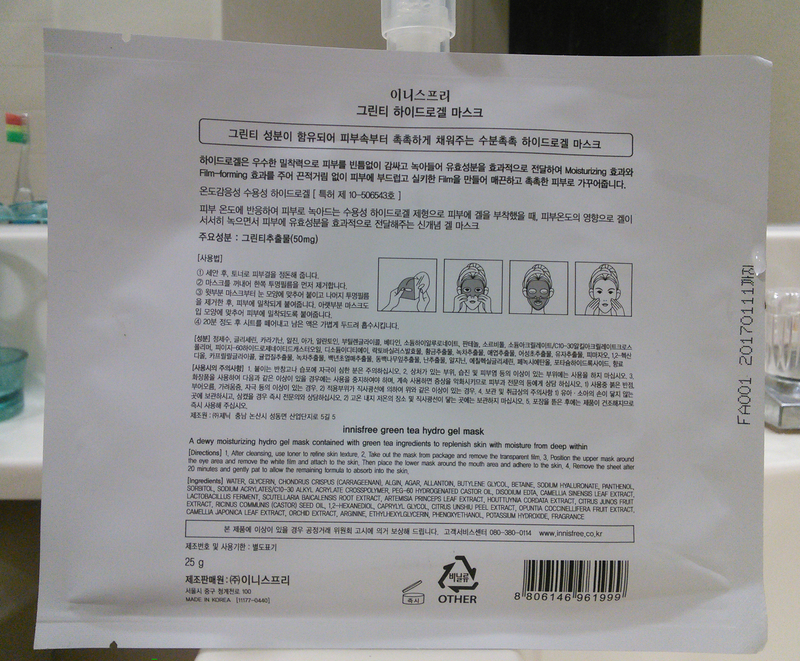 A CosDNA analysis of the Innisfree Green Tea Hydro Gel Mask did turn up a couple of cautions. The two biggest flags involve the algae extracts used to thicken the essence into a hydrogel format: chondrus crispus (carrageenan) got a full 5 as a potential acne trigger and a 2 as a potential irritant, and algin scored 4s for both acne and irritant status. Butylene glycol and castor seed oil received 1s in the acne column. If your skin is particularly reactive or you’ve had trouble with algae-based products before, you may want to steer clear or at least patch test before using. I’ve gone through two of these so far, both times after having been outside a lot during the day–green tea is just the thing to soothe skin and mitigate any sun or pollution damage. I have to say, these masks are just weird. The rest of the hydrogel masks I’ve used have been characterized by a relatively substantial thickness and a very pliable quality thanks to the thinness of the gauze mesh inner weave that holds the gel in shape. The Innisfree Green Tea Hydro Gel Mask does not feel like this at all. I was actually startled the first time I wrestled one out from its elaborate system of plastic backings. These masks are on the thin side for hydrogels and unusually stiff; I’m pretty sure the inner mesh in these is made of plastic instead of fabric for some weird reason. The mesh is thicker, more rigid, and definitely feels like plastic at the end of the masking session, when most of the gel has been absorbed and the mesh is exposed. Thanks to that rigidity, the Innisfree Green Tea Hydro Gel masks don’t adhere to my face nearly as well as other hydrogels, especially around my jawline, where they need to stick to the underside of my jaw, and on the top of my nose, where I always have to fold back a little of the material so that it isn’t flapping back and forth annoyingly with my every breath. These little details make these masks feel lower quality than any of the others I’ve tried, including my beloved and now discontinued Innisfree Eco Science Hydro Gel Masks (which now live on only in memory and in this screencap of my thoughts the first time I used one). The Innisfree Green Tea Hydro Gel masks make my skin feel mildly tingly and warm, even though I always get them straight out of the fridge. The tingling sensation reminds me of Mr. Crazy Snail Lady’s issues with the Innisfree It’s Real Squeeze Mask in Green Tea. He and I have very different skin types, and mine is much hardier than his thanks to the attention I pay to my moisture barrier, but now we’ve both had a warm-and-tingly-not-in-the-good-way experience from an Innisfree green tea mask. Pattern? Maybe. Most of the gel essence from these masks absorbs into my skin by about the 45 minute mark, and it really does sink into my skin, leaving very little moisture on the surface. Disappointingly, however, these masks don’t make my skin feel particularly hydrated or plumped, either immediately after removal or the morning after. On the plus side, however, they do reduce my normal areas of redness (right around the nostrils, between the eyebrows, and around my mouth), and they have a strong purifying effect that leaves the pores on my nose looking much smaller and cleaner than usual. Conclusion: Eh. For redness and general skin clarity, the Innisfree Green Tea Hydro Gel Mask is effective, but for hydration and plumping, I’ve had better. In fact, even a regular cheapie sheet mask usually hydrates my skin better than this one did, and since redness and pores aren’t really major issues for me, I think I’ll pass on purchasing again. I’m also unnerved by the fact that this one made my skin tingle a little. Where can I buy Innisfree Green Tea Hydro Gel Masks? If you want to try these masks, I found them for 2,000 won ($1.83USD at the time of this review) on TesterKorea and for $3USD on the official Innisfree website. While TK’s price is significantly cheaper than Innisfreeworld’s, remember that Innisfreeworld often offers coupons and discounts–including shipping discounts–and tends to ship faster than TesterKorea, which has had an unfortunate recent habit of processing orders for weeks before sending them out. I ordered some last night and thought of you, haha! Roseroseshop is selling innisfree masks for $1.55 right now. If you’re interested in more of the other ones (I think you said you were on AB), then that might be a good place to haul! Yeah, I might try to snag some Eco Science if they still have any. Thanks! Maybe it’s the green tea that makes it less moisturizing? I use a diy green toner and it dries out my skin. I love it because it’s great for inflammation and it’s a phenomenal antioxidant. Could be. It’s funny that their “Hydrating” skin care line is based on green tea–I forgot it’s astringent!